Looks like this week's posts will be delayed a few days because of some work and family commitments - the last two episodes of "Monticello Party Line" and some other goodies will be going up soon. Instead, I'd like to offer up an amusing little old time radio collecting story. You might recall this odd 45 rpm box set posted a couple of years ago on the blog. 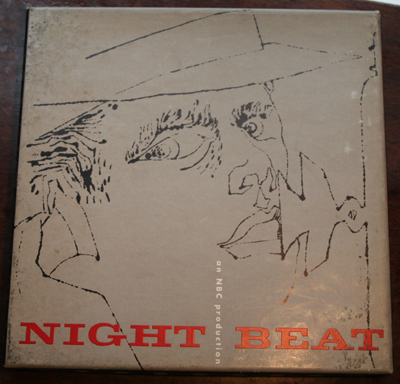 Pressed by RCA, the set contained three records - 7" 45s - that contain a full episode of the crime drama "Night Beat". It's unusual in that it also contains a promo announcement, after the opening of the show, inviting potential sponsors to pick up the program. I found the set at the Burlington, NC Goodwill thrift store - I think I might have paid 50 cents for it. A few months after I put the show from the set on my blog, I was contacted by a gentleman from Montreal. He had an original NBC reference acetate of the first audition episode of the series - a rare find indeed. So, we set up a trade and I posted that disc on the blog. One of the readers of the blog, Thomas, noted in a comment that the "Night Beat" promo 45 set is something rather unusual. You see, around 1949, when the set was created, there was a promising young commercial artist who was designing magazine ads and some album covers. Thomas had found the "Night Beat" set in a museum catalogue of record covers designed by Warhol. Turns out it's collectable as a piece of art. Thomas also pointed me to another otr related lp from circa 1950 that had similar cover art by Warhol currently on ebay, "The Nation's Nightmare", which contained two CBS news programs about the country's drug problems. Well, the story gets better. I contacted the gentleman in Montreal about his find. Turns out, he was the author, Paul Marechal, who put together the original exhibition featuring Warhol's album covers - the "Night Beat" set I traded him is the one that Thomas found in the book. Paul believes that the "Night Beat" set I found is the only copy to surface - he's going to donate it to a Warhol archives, along with some of the other rare Warhol works he discovered in his research. My guess is that it turned up in Burlington, NC because it was given to an employee of Lorillard or RJR Tobacco, both located in the Triad NC area. Oh - that Warhol lp of "The Nation's Nightmare" that Thomas saw on ebay? Moral of the story - look carefully at memorabilia you find at Goodwill. You might go looking for an old radio show and be taking home a work of art instead. More new shows in a few days. Did you know that, at one time, bars and other locations had a "jukebox" that contained no records? You might have never heard of it, but these jukeboxes were connected by wire to a central location where an operator would pull records you requested. You could talk to the operator through the jukebox. This type of music device is at the center of this blog post, "Juke Box Romance", an episode of "Night Beat" from May 18, 1951. Reporter Randy Stone, in this noir look at a big city paper, investigates a store robbery that takes several plot turns. I won't give any of it away, but it does involve a self-inflated actor played by the hardest working man in old time radio, William Conrad. The show was transferred from an original lacquer line check from an unknown local NBC station. The show includes the NBC chimes and catchy singing promotional announcements for the network. Note: The following post originally appeared on my general personal blog on December 28, 2007. I'm posting it here to put all my OTR material in one place and to offer up a complete dub of the show. Please note that I no longer own this 45 set, having traded it to a collector in Canada for the NBC acetate of the audition for Night Beat, previously posted here. The MP3 attached to this post was dubbed directly from the 45 rpm set. On a recent trip to Goodwill, I found a curious little 45 rpm record set. After RCA developed the 45 rpm record, they promoted the format as a replacement for 78 rpm album sets and singles. In the late 40s and through the early 50s, they issued album sets in various genres and promoted RCA record changers for 45s that could be hooked up as auxiliary devices to radio sets. At Goodwill, there were a few of these sets by artists like Wayne King and Vaughn Monroe, but one caught my eye. It was called "Night Beat" and featured an NBC record label. I've heard an old NBC radio drama series by that name, but had never seen a radio show issued on 45s like this. Curious, I picked up the set and checked it out. The set consists of one complete episode of the show with an announcement aimed at advertisers inserted just after the opening, inviting potential sponsors to buy time on the program. So, this appears to be a promotional set put out by NBC. I'm guessing that someone at NBC saw it as a chance to promote the series to advertisers in the face of competition from television. Indeed, "Night Beat" was sustained, without a sponsor, for the first few months of its run. I posted about the set on the OTR mailing list and Michael Biel helpfully provided some additional information about the set. The label and matrix numbers are EO-CX-342 through 347 and the label runoff area includes an "I" notation near the matrix number. According to Biel, "EO" is a date code indicating 1950. The "C" indicates "Custom", pressed by RCA for a special purpose (a "K" would be used if the records were custom pressed for an outside customer). Biel estimates that the master numbers were done early in the year, perhaps mid-January to early February. The "X" in the matrix number is a problem - usually a "W" was used in this position at the time. Biel thinks this might be a holdover from the "X" used in this position during secret development of the 45 rpm system between 1940 and 1948. The "I" indication is a code for pressings done in the Indianapolis plant. The source of the recording sounds to my ears like a 16" transcription - halfway through the show, you can hear a side change where the audio quality changes, similar to what might be heard when going from the end of one side of a transcription to the beginning of a second side. Despite no episode title in the program or on the label, the episode on the records appears to be "Zero", the first show of the series broadcast on February 6, 1950, according to a log of the series. Anyone have any additional info on the set or seen others like it? Was there other material, like a press kit, also released? Was it sent to ad agencies or advertising departments at some companies? Here's another program that should be an upgrade in sound quality for many otr enthusiasts. It's the first audition program created for the series "Night Beat", transferred directly from an original NBC reference acetate. My apologies for the skip on side two, but I couldn't figure out a way to play through that one. This was the first pilot for the series. Rather than Frank Lovejoy playing a character named Randy Stone, the audition features Edmond O'Brien as Hank Mitchell. Episodic logs for "Night Beat" I've seen date this audition to September 15, 1949, but the label is dated May 19, 1949. (Was it recorded in May and aired in September?) In the show, titled "The Ted Carter Murder Case", an old friend of Mitchell's who is mixed up with a gangster is killed and Mitchell, feeling responsible, goes after the killer. Many thanks to collector and otr fan Paul in Montreal who was kind enough to trade me this rare disc for another in my own collection. Fans of "Night Beat" that are curious about the origins of the show can also see a special 45 rpm set that NBC created for potential advertisers that contains the episode "Zero" from the series in this older post from my personal blog. The blog entry contains a sound clip of the opening of the show from the set that includes a commercial announcement, inviting advertisers to sponsor the program.